After three launch delays due to technical problems and bad weather, the shuttle Discovery was grounded again Friday, its final launch delayed to at least Nov. 30, because of a hydrogen leak in a vent line attached to the ship's external tank. After the scrub was declared, engineers discovered a large crack in the protective foam insulation on the tank that likely would have caused a launch delay even if the leak had not developed. Engineers have not yet evaluated the crack to know what sort of repairs, if any, might be needed or even whether the damage can be fixed at the launch pad. Discovery's astronauts have exited pre-flight medical quarantine and will be flying back to their homes in Houston this afternoon. Moses says the foam crack is located on the front side of the tank facing the orbiter and just above the bipod where Discovery's nose is attached. He said it's too soon to know what might need to be done with that crack. Mission Management Team prelaunch chairman Mike Moses says officials determined it just wasn't prudent to push toward a Monday launch attempt given the amount of work ahead to resolve the hydrogen leak. FURTHER DELAY. Shuttle Discovery won't fly before November 30 at 4:05 a.m. EST, officials have announced. A press conference is coming up shortly with additional details behind the decision. We'll stream it live. An 8-inch crack has been spotted in the foam covering the intertank section of the shuttle Discovery's external tank. Engineers are assessing that situation, which has developed since the tank was drained of its supercold propellants today. A "significant" hydrogen leak in a vent arm attached to the shuttle Discovery's external tank will delay another launch attempt until at least Monday, the final day of the current launch window, NASA officials said Friday. If Discovery is not off the ground by then, launch will be delayed to Nov. 30, the opening of the year's final shuttle launch opportunity. "The day looked OK but the hardware was talking to us and it's a significant leak at the hydrogen vent arm. "The signature of the leak is similar to what we've seen in the past when we've had leaks there, although the magnitude was higher this time and it occurred earlier in our tanking process. It actually occurred during fast-fill where in the past we'd gotten into a topping regime before the leak occurred. The leak followed the vent valve cycling very closely, every time we cycled the vent we saw the leak, so that's indicative of something going wrong down inside of that quick-disconnect. "We've gotten into drain of course. We'll be done draining in another hour, maybe an hour-and-a-half, something like that. Then we go into a period of time, probably about 20 hours, 22 hours of inerting the hydrogen tank, then we're going to be able to get our hands on the hardware out at the launch pad tomorrow afternoon, maybe late morning...and take a look at it and see where we go from here. "It's my hope that given the magnitude of the leak that once we get the GUCP taken apart, we'll see something wrong that's obvious to us, go fix it, put it back together and get a launch attempt before the end of this window. That's my hope. I'm not sure that's how it's going to turn out, but that's the challenge that we've put out to the team." Monday is the soonest Discovery could get another next shot at launching, Leinbach says. "The earliest possibility is Monday. We've gone officially into a 72-hour scrub turnaround, knowing that's our last launch attempt in this window. There's certain tricks that we might be able to do when we pull the GUCP apart that says you get to the work quicker. A lot of the engineering contingent are going to want to take very, very detailed measurements as we're taking this thing apart, and that may end up being what we ent do. If we do all that detailed work, that probably extends the timeline because that's what we did in the past to get to that 72 hours. "So we're not going to push the team, but we have asked them if 'is there anything you can do in a 72 to get to that launch attempt on Monday' because a lot of us believe that given the magnitude of the leak we're going to see something obvious when we get it apart. If that's the case, then we'll change out whatever has gone wrong and put it back together and hopefully that supports Monday. "And that's the challenge. We're going to get together later this morning with the OPS and engineering teams, review that kinda top-level assessment, top-level plan that we've asked. Then the detailed engineering reviews and troubleshooting plans will kick in later this afternoon. We'll present that to the program tomorrow sometime, what the actual options are. We won't know what's gone wrong with the GUCP until we get our hands on it, which will be tomorrow afternoon sometime. "So right now it's a lot of speculation, but obviously the hardware was talking to us, it leaked significantly and it was a case where we were violating not only launch commit criteria but also some of our ground safety requirements -- limits on hydrogen in free air. So we elected to scrub obviously and that was the best course of action." The official launch window on Monday would open at 12:48:15 and last until 12:58:15 p.m. EST. The targeted liftoff time occurs in the middle of the period at 12:53:15 p.m. EST. That's the moment when Earth's rotation carries the launch pad into the plane of the International Space Station's orbit. If the launch is delayed until after the period of unfavorable solar angles on the station complex and the Soyuz landing of the Expedition 25 crew, liftoff could come on November 30 at 4:05:46 a.m. or December 1 at 3:40:01 a.m. EST. Engineering and management meetings will get underway at 11 a.m. EDT to decide how to tackle this problem and decide when Discovery's launch could occur. That post-scrub news briefing now isn't expected until sometime later in the afternoon. NASA now says Monday would be the soonest that shuttle Discovery could attempt launch again. Liftoff time would be 12:53 p.m. EST (1753 GMT). But that's still preliminary and depends on how much time is spent fixing this leak. A post-scrub news conference is planned later this morning. NASA says this could be a minimum 48-hour delay given the amount of time it will take to safe Discovery and allow technicians to get their hands on the ground umbilical carrier plate (GUCP). SCRUB! Today's liftoff of space shuttle Discovery has been postponed due to a leak in the gaseous hydrogen venting system between the launch pad and external fuel tank. This is the same problem that delayed a pair of shuttle missions last year. When Discovery could make another launch attempt is not known. Obviously, the leak will have to be fixed. NASA faces a Sunday or Monday deadline the get the shuttle launched or else wait until December 1 due to a period of unfavorable thermal conditions in the orbit with the International Space Station. NASA commentator Allard Beutel says limited troubleshooting is being performed to cycle the valve and limit the flow in hopes of clearing the leak. At this point, a launch scrub has not been declared. The GUCP fits to the backside of the space shuttle to funnel gaseous hydrogen from the external fuel tank. Plumbing then carries the gas across an umilical arm to the pad tower, down to the ground and eventually out to the flare stack for burning. The leak this morning is where the ground equipment attaches to the shuttle. A leak has reoccurred in the gaseous hydrogen venting system between the launch pad and space shuttle Discovery. This is the place where leaks happened during countdowns for the STS-119 and STS-127 missions last year. Engineers are assessing the situation to determine the next course of action. The launch team has detected a leak around the ground umbilical carrier plate on the backside of the external fuel tank. This problem has occurred on a few recent shuttle missions, as you may recall. Whether this is going to delay today's launch is not yet known. Liquid hydrogen loading has switched to the "fast-fill" mode as fueling of space shuttle Discovery proceeds via remote control at launch pad 39A. And now liquid oxygen has started fast-fill. Liquid oxygen completed the chilldown thermal conditioning process and the loading has moved into the slow-fill process. The fueling sequence started with the chilldown of the liquid oxygen system at 5:58 a.m. EDT. The transfer lines on the liquid oxygen side will be chilled down, then the main propulsion system conditioning is completed. The liquid hydrogen loading has transitioned from the chilldown thermal conditioning process to the "slow-fill" mode. This fills a small fraction of the tank, then the loading switches to "fast-fill" mode. The propellant started flowing into the tank at 6:09 a.m. EDT. Given that the team had to move the mobile tower overnight, the final clearing of the launch pad came later than planned this morning. So activities are running a bit behind schedule and delayed the start of fueling by at least a few minutes. However, that won't be any problem for launching at 3:04 p.m. EDT today. After the overnight retraction of the gantry, technicians have been working to finish configuring the launch pad. They are clearing the hazard area now. The latest forecast for today's launch gives a 70 percent chance of acceptable weather for Discovery. Gusty winds are the only concern now. The launch time conditions at 3:04 p.m. EDT are expected to include just a few clouds at 4,000 feet, visibility of 7 miles, a temperature of 66 degrees and northwesterly winds at 18 knots gusting to 26 knots. The odds of good weather for Saturday and Sunday have been revised to 60 percent and 40 percent, respectively. T-minus 6 hours and holding. The countdown has gone into the scheduled two-hour built-in hold prior to the start of fueling. The Mission Management Team is scheduled to convene its critical pre-fueling meeting at 5 a.m. EDT. The service structure is starting to rotate away from shuttle Discovery, once again unveiling the orbiter for launch. The gantry had been retracted Wednesday night but was returned late Thursday evening to enable technicians to check a pair of thruster covers on the shuttle. Now expecting at least another hour before gantry rollback. Current estimations say tower retraction will begin a little after 1:30 a.m. EDT. T-minus 11 hours and counting! Following Thursday's weather-forced launch delay, the countdown was recycled to the T-minus 11 hour mark. But now clocks just began ticking for Friday's planned 3:04 p.m. EDT blastoff of Discovery. Pre-planned holds are scheduled at T-minus 6 hours, T-minus 3 hours, T-minus 20 minutes and T-minus 9 minutes, all designed to give the team margin to deal with issues that can pop up. Pad crews will soon be doing the walkdown inspections around the gantry in preparation for retraction. Tonight's unplanned work on two thruster nozzle covers should have no impact to the launch countdown since there's ample slack in the schedule. The launch pad's mobile gantry is giving technicians access to shuttle Discovery this evening for checking thruster coverings that may have come loose today. The Tyvek covers ensure no rain or moisture gets into the spacecraft's maneuvering thrusters and jets. If rain enters the nozzles before launch, the water can freeze in space and cause the thruster to leak. In such a scenario, flight controllers would declare that thruster failed and unavailable to assist with maneuvers. Assuming tonight's work can be completed quickly, the tower will be retracted overnight and launch of Discovery can proceed as planned on Friday afternoon. NASA designed special coverings in the post-Columbia era that have flaps to catch air and pull off the vehicle during liftoff. The protective rotating service structure at launch pad 39A has been rolled back around shuttle Discovery tonight, covering up the orbiter for now. The tower had been left open throughout the day despite the launch delay to Friday. It's not immediately clear why the gantry was moved to enclose Discovery about 40 minutes ago. We're working to find out the reason. Obviously, the structure will have to be retracted to its open position overnight to allow fueling preparations to begin. The official launch window for Friday's shot at getting space shuttle Discovery into orbit for docking with the International Space Station extends for 10 minutes. Based on the latest radar tracking of the space station's orbit and subsequent revision from Mission Control, the single-pane window leading to rendezvous on Flight Day 3 will open at 2:59:01 and last until 3:09:01 p.m. EDT. The targeted liftoff time occurs in the middle of the period at 3:04:01 p.m. EDT. That's the moment when Earth's rotation carries the launch pad into the plane of the station's orbit. If the launch is delayed to Saturday for some reason, a single-pane window and Flight Day 3 docking scenario will be available for the backup liftoff opportunity as well. The window would stretch from 2:36:29 to 2:46:30 p.m. and include an optimum launch time of 2:41:30 p.m. EDT. Check out the stunning first batch of pictures taken during closest approach to comet Hartley 2 this morning! A recycled NASA spacecraft is hurtling toward an encounter this morning with comet Hartley 2, an icy ball of primordial rock, dust and gas that could hold the key to better understanding the birth of the solar system. About the size of a compact car, the robotic spacecraft will shoot past the comet at a distance of about 700 kilometers, or 435 miles. Closest approach is expected around 1400 GMT (10 a.m. EDT). The probe's two cameras will track the comet as it flies by at a relative speed of more than 27,500 mph, snapping more than 118,000 images during the approach, encounter and departure sequences. Scientists say the mission is collecting about 1.5 gigabytes of data during the flyby, yielding unprecedented views of Hartley 2, which will become just the fifth comet ever imaged by a nearby spacecraft. With rain showers and low clouds sweeping over NASA's Florida spaceport, agency managers decided early Thursday not to fuel the shuttle Discovery, delaying launch another 24 hours to Friday at 3:04 p.m. EDT. While conditions will improve in the wake of a cold front, forecasters are predicting a 40 percent chance of high winds that could cause another scrub. Friday's launch activities will include a Mission Management Team meeting at 5 a.m., fueling of the external tank starting no sooner than 5:39 a.m., the astronauts donning their spacesuits around 10:40 a.m. and the crew departing quarters at 11:14 a.m. The precise launch time aims for the moment when Earth's rotation carries pad 39A into alignment with the International Space Station's orbital plane. That happens at 3:04:00 p.m. EDT. The day's overall launch window, setting up rendezvous opportunities on both Flight Days 3 and 4 for Discovery and the International Space Station, stretches from 2:59:00 to 3:12:13 p.m. EDT. SCRUB. The Mission Management Team has decided the weather conditions are too unfavorable to attempt launching space shuttle Discovery today. The countdown will hold for 24 hours and retarget a liftoff on Friday at 3:04 p.m. EDT (1904 GMT). The weather outlook for Friday calls for only a few clouds at 4,000 feet, northerly winds of 18 gusting to 26 knots and a temperature of 66 degrees. The overall probability of acceptable weather is 60 percent, with low cloud ceilings and gusty winds the issues. T-minus 6 hours and still holding. The countdown clocks have not resumed ticking after the planned two-hour hold. The current weather conditions at Kennedy Space Center, although rainy, are within limits to begin fueling Discovery. None of the temperature, wind or lightning constraints are being violated. The latest weather forecast for today's launch continues to give only a 20 percent chance of conditions permitting Discovery to fly. The launch time conditions at 3:29 p.m. EDT are expected to include broken decks of clouds at 3,000 and 6,000 feet, overcast skies at 25,000 feet, showers and thunderstorms in the vicinity, visibility of 7 miles, southwesterly winds at 12 knots gusting to 18 knots and a temperature of 74 degrees. As expected, it's a very wet morning as the weather system dumps rain on the Space Coast and shuttle Discovery. The pre-fueling management team meeting is underway to decide whether to start loading the external tank on-time. The official launch window for today's shot at getting space shuttle Discovery into orbit for docking with the International Space Station extends for 10 minutes. Based on the latest radar tracking of the space station's orbit and subsequent revision from Mission Control, the single-pane window leading to rendezvous on Flight Day 3 will open at 3:24:43 and last until 3:34:44 p.m. EDT. The targeted liftoff time occurs in the middle of the period at 3:29:43 p.m. EDT. That's the moment when Earth's rotation carries the launch pad into the plane of the station's orbit. T-minus 6 hours and holding. The countdown has gone into the scheduled two-hour built-in hold prior to the start of fueling. The Mission Management Team is scheduled to convene its critical pre-fueling meeting at 5:30 a.m. EDT. "Discovery, herself, is a fine ship, she's ready to go, just hate to see her retire so early in her life," says shuttle launch director Mike Leinbach. "It's still kinda hard to believe. It has been around forever. People that are under 30 years old have always seen America fly the space shuttle, so it's been part of our history, part of American culture, and it's going to be different without flying the shuttle. "This particular orbiter has served us extremely well. It is the fleet leader. It's going to be hard to see her retire, but we need to do what we need to do for the agency, so we'll get on with her final flight and make it the best one ever." Clocks will resume counting at 11:04 p.m. EDT after the one-and-a-half-day hold at T-minus 11 hours. The orbiter's fuel cells are activated about an hour later, and the hazard area around the pad gets cleared of all workers overnight. The next planned hold is T-minus 6 hours beginning at 4:04 a.m. EDT. During this two-hour pause of the clocks, the Mission Management Team convenes its pre-fueling meeting around 5:30 a.m. to review the status of work, the readiness of shuttle systems and the latest weather forecast. If all goes according to plan, loading of the external tank with propellant will start at 6:04 a.m. EDT. The process should take three hours to complete. Join us here in the Mission Status Center for live play-by-play updates throughout the day. And don't miss our launch webcast anchored by Miles O'Brien that begins at 11:00 a.m. EDT (1500 GMT). Miles will be joined by former space station commander Leroy Chiao, journalist David Waters and several special guests. Liftoff time is 3:29 p.m. EDT (1929 GMT) as Discovery sets sail on her final space voyage. "There's still a certain amount of disbelief that it's really her final launch. We all know it, we've come to grips with that fact. But it's hard to believe after having Discovery and the rest of the fleet for 30 years flying so well for America, to bring it to an end, it's difficult to accept emotionally. But, rationally, we know all it's coming to an end and we need to get on with it. We'll finish this mission and then put Discovery into the transition-and-retirement phase and start safing her and getting her ready for disposition, some museum somewhere," Leinbach says. Latest revision of the NASA Television schedule for Discovery's mission now published. Despite threatening weather, NASA managers Wednesday cleared the shuttle Discovery for launch Thursday on its 39th and final mission, deciding an electrical glitch that prompted a 24-hour delay was not a threat to flight safety. Liftoff was targeted for 3:29:43 p.m. EDT. The lightning concern is clearing and tower rollback should start soon. "At the end of the day, I'll cut to the chase and say we wrapped up with a unanimous poll out of the MMT, no dissenting opinions, no request for more data, everybody was very comfortable with the story that came together," Mission Management Team prelaunch chairman Mike Moses says. The weather forecast for Thursday's launch opportunity gives only a 20 percent chance of conditions permitting Discovery to fly. "Our primary concerns for launch are cumulus and anvil clouds within 10 nautical miles of the launch pad, flight through precipitation, showers and thunderstorms within 20 nautical miles of the Shuttle Landing Facility (SLF)," the weather team says. Retraction of cocoon-like service gantry to reveal shuttle Discovery for launch remains in a weather hold due to lightning concerns. GO to continue. The management team has given approval to press ahead with shuttle Discovery preparations for tomorrow's launch. A news briefing is planned for 7 p.m. EDT. Rollback of the mobile service tower can't begin if there's a chance of lightning during the operation. Some stormy weather is moving northward up through Brevard County right now. The MMT meeting has resumed. Mission Management Team continues to assess the electrical issue and no final decisions have been made about tomorrow's launch attempt. Members are taking a brief break before reconvening after 6 p.m.
Technicians at launch pad 39A are pressing ahead with preparations to retract the rotating service structure away from shuttle Discovery this evening. Tower rollback is expected to start sometime between 6:30 and 7 p.m. EDT. You will be able to see live video here. The meeting continues in progress. The Mission Management Team began meeting at about 2:45 p.m. EDT to receive a briefing from the engineers who have examined the electrical circuitry, history of the circuit breaker and switches and specific data collected on Discovery, then developed the rationale why the shuttle can safely fly as-is. That mountain of data is being presented to officials that will make the final decision this afternoon whether to resume the countdown to launch Thursday or if the flight should be delayed further to replace any hardware. NASA plans a post-meeting news conference. The exact time will be announced later. With the space shuttle Discovery's countdown on hold, engineers reviewed historical data and refined a "fault tree" to understand what caused irregularities in a critical circuit Tuesday, delaying launch to at least Thursday. The weather forecast for Thursday's launch opportunity is bleak, with meteorologists giving just a 20 percent chance of conditions permitting Discovery to fly. The odds increase to 60 percent on Friday and go back down to 40 percent on Saturday. The outlook from Air Force meteorologists: "A cut-off low over Texas will drift into the Gulf of Mexico today. A cold front is moving into the Great Lakes area and will continue moving southeast through the Eastern U.S. through the day. Thursday, the front cold front will move into Florida as a strong upper level trough deepens in the Eastern U.S., pushing the cut-off low in the Gulf through the Florida Peninsula. Widespread showers and scattered thunderstorms are expected with the front, and there is also potential for isolated severe thunderstorms." The launch time conditions on Thursday afternoon are expected to include broken decks of clouds at 3,000 and 6,000 feet, overcast skies at 25,000 feet, showers and thunderstorms in the vicinity, visibility of 7 miles, southwesterly winds at 12 knots gusting to 18 knots and a temperature of 74 degrees. "The front will move through Central Florida Thursday evening, and Friday, strong northwesterly winds are expected behind the front. This causes concerns for both SLF headwinds as well as launch pad winds. Saturday, the winds increase and become more northerly, increasing the threat of a launch pad wind violation." The shuttle Discovery's launch on a space station resupply mission Wednesday was delayed at least 24 hours, to no earlier than 3:29:43 p.m. EDT Thursday, to give engineers more time to troubleshoot an apparent electrical glitch in circuitry associated with a backup main engine computer. Mission Management Team prelaunch chairman Mike Moses says engineers need another day to examine the voltage irregularities and analyze the situation before allowing Discovery to potentially fly as-is. Another meeting is planned for 2 p.m. EDT on Wednesday. Replacing the circuit breaker or the main engine controller would be invasive procedures and cause longer delays. A post-scrub news conference will be held this evening at approximately 6:30 p.m. EDT. DELAY. Launch of space shuttle Discovery has been postponed at least 24 hours to give technicians additional time for troubleshooting the electrical problem with the main engine controller circuitry. If the issue can be resolved in time for launch on Thursday, the liftoff would be targeted for 3:29 p.m. EDT (1929 GMT). However, there's only a 30 percent chance of acceptable weather for Thursday. The Mission Management Team meeting is getting underway now. We should know shortly if NASA will delay tomorrow's launch attempt or press ahead. NASA says the Mission Management Team meeting has been delayed from 3 p.m. to 5 p.m. EDT. The team will be convening to discuss the voltage irregularities seen with the circuitry for space shuttle main engine No. 3's backup controller. Engineers readying the shuttle Discovery for launch Wednesday on a space station resupply mission are troubleshooting an apparent electrical problem with circuitry associated with a backup main engine computer. They said earlier today the problem had been resolved, but another glitch in the system raised concerns and additional troubleshooting was ordered. After overcoming a couple of glitches, the final day of Discovery's launch countdown is underway at the Kennedy Space Center for Wednesday's targeted 3:52 p.m. EDT blastoff of the space shuttle. A nitrogen purge issue was found and fixed last evening. And the final tests of the avionics, pneumatics and controllers for the three main engines were interrupted overnight due to a glitch that's since been resolved, the launch team reports. "We had to go repair a faulty regulator on our launch pad nitrogen purge system. It has a primary and a secondary leg to it, they are redundant systems. The primary side had a bad regulator, so we finished our reactant load (for fuel cells) as we intended to and in the time after that we went and repaired the primary side. And it's back up and supporting, it's in launch configuration now. "We also had a little excitement early this morning when we were doing our engine checkouts. We brought up our engine controllers, when we got to our engine No. 3 backup engine controller, it didn't come up as we had expected. Apparently, there was something wrong with one of the three phases that provide power to it. "After doing some troubleshooting, we narrowed it down to either the circuit breaker or switch that provides it power. We did some troubleshooting, recycled the breaker, recycled the switch. We kind of narrowed it down to transient contamination. Once in a while you get that when you push a switch and it doesn't go. "After cycling the switch and the breaker a few times, it cleared up, the controllers powered up normally, we did the checkout and they are now back up and supporting. We just recently completed the engine checkouts, so they are back up and running and they should be that way all the way through T-0. "They are still talking about final disposition, so the paperwork isn't closed, but I think we're going to be OK on that one as well." The switches in the cockpit are positioned where they need to be and won't be moved again through launch. Countdown clocks entered the lengthy T-minus 11 hour planned hold period at 10 a.m. That built-in hold should last 13 hours and 27 minutes. The giant gantry-like rotating service structure is scheduled for retraction from around Discovery at 7:00 p.m. EDT. Fueling of Discovery's giant external tank begins at 6:27 a.m. EDT tomorrow. "Next to the launch itself, this is the part I like best. We're in launch countdown within a day of launch. There's a lot of excitement in the air. Everyone is putting on their game face and getting ready for the launch tomorrow," Payne said. The weather forecast for Wednesday's launch remains favorable with a 70 percent chance of conditions within allowable limits. The odds drop to just 30 percent on Thursday and go back up to 70 percent on Friday. The outlook from Air Force meteorologists: "An upper-level low is deepening into Texas and will cut off over the next 24 hours and drift into the Western Gulf of Mexico. The low to the west is causing a weak warm front to migrate north through Central Florida bringing showers and clouds into the area. Although the warm front will migrate north tomorrow, a warm, moist atmosphere will prevail over Central Florida and become more unstable through the day. Late morning showers and low clouds may cause weather violations during the countdown, but conditions should improve into the afternoon along the coast. "Still, our primary concerns for launch are a low-cloud ceiling and showers within 20 nautical miles of the Shuttle Landing Facility (SLF)." The launch time conditions are expected to include some scattered clouds at 3,000, broken levels at 7,000 and 25,000 feet, a chance of isolated showers, good visibility, east-southeasterly winds at 11 knots gusting to 17 knots and a temperature of 78 degrees. "Thursday, a cold front will move into Florida as a strong upper level trough deepens in the Eastern U.S. The trough will push the cut-off low in the Western Gulf toward Florida. With this, there is potential for a low-cloud ceiling, showers, and even thunderstorms in Central Florida on Thursday," forecasters say. "The front will move through Central Florida Thursday evening, and Friday, strong northwesterly winds are expected behind the front." Liquid hydrogen and liquid oxygen reactants for space shuttle Discovery's electricity-generating fuel cells were successfully loaded into storage spheres beneath payload bay on Monday. The cryogenics are combined by the three onboard fuel cells to produce power and a byproduct of drinking water during the shuttle's mission. Technicians transferred the reactants into small tanks on the orbiter during a multi-hour operation at pad 39A. Work is underway tonight to adjust the tank levels, actually draining some off, to optimize Discovery's launch weight. NASA managers met Monday to review the shuttle Discovery's readiness for flight and unanimously agreed to press ahead with launch Wednesday, weather permitting, on a voyage to the International Space Station. It will be Discovery's 39th and final mission. The Mission Management Team gathered this morning for its pre-launch meeting and verified all remains on track for shuttle Discovery's blastoff at 3:52 p.m. EDT on Wednesday. "We had our L-2 Mission Management Team meeting this morning. Went very quickly. If I wouldn't have talked about how quickly it was going, it would have gone even faster. We didn't have any technical issues to discuss," says pre-launch MMT chairman Mike Moses. "Everything is going really, really well. We recovered from our problems over the weekend in fine shape. I went through the Firing Room this morning, the team is in great spirits, they're looking forward to launching Discovery for the final time and getting her on to a great mission," shuttle launch director Mike Leinbach says. After completing tests of the shuttle's pyrotechnic initiator controllers, work to load the liquid hydrogen and liquid oxygen into Discovery's power-generating fuel cells is beginning. The countdown resumed ticking at 10 a.m. from the planned hold at T-minus 27 hours and will continue until the next hold point at T-minus 19 hours starting at 6 p.m. EDT, which is when the ground team wrap up the fuel cell servicing work. Discovery's all-veteran crew are scheduled to undergo medical exams today. Commander Steve Lindsey and pilot Eric Boe will get some landing practice using Shuttle Training Aircraft at the Kennedy Space Center runway. A briefing on the orbiter ingress plan for launch day is planned this afternoon too. The weather outlook continues to give favorable odds for launching Discovery on Wednesday, with a 70 percent chance of acceptable conditions. The small chance of weather prohibiting launch involves the possibility of low clouds and rainshowers in the area. The specifics call for scattered clouds at 3,000 feet, a broken deck at 7,000 feet and broken high clouds at 25,000 feet, good visibility, east-southeasterly winds of 11 peaking to 17 knots and a temperature of 78 degrees. "The high pressure ridge providing favorable weather to Central Florida will break down over the next few days as an upper level trough deepens and cuts-off over the Western Gulf of Mexico. By launch day, moisture will migrate from the south into Central Florida causing a chance for low clouds and isolated showers," the weather team reported this morning. But if Discovery's launch slips to Thursday for some reason, the forecast on the backup day has worsened due to a cold front expected to move through Central Florida. There's only a 40 percent chance of acceptable weather because of cloud ceilings, rain and potential thunderstorms. "Thursday, a cold front will move into Florida as a strong upper level trough deepens in the Eastern U.S. The trough will push the cut-off low in the Western Gulf toward Florida. With this, there is potential for a low-cloud ceiling, showers, and even thunderstorms in Central Florida on Thursday. As a result, the probability of KSC weather prohibiting launch increased," forecasters say. The picture improves for Friday and another 70 percent favorable forecast then. "The front will move through Central Florida Thursday evening, and Friday, strong northwesterly winds are expected behind the front." COUNT BEGINS. Countdown clocks at the Kennedy Space Center just began ticking toward Wednesday's scheduled launch of the space shuttle Discovery. The official countdown sequence started at 2 p.m. EDT inside Firing Room 4 of the Complex 39 Launch Control Center. Launch team members had gathered for the "call-to-stations" at 1:30 p.m. EDT. The count commenced from the T-minus 43 hour mark. But a series of pre-planned holds are timed throughout the next few days, leading to the targeted liftoff time of 3:52 p.m. EDT. "This is going to be Discovery's 39th and final flight, and it's going to be bringing the Permanent Multipurpose Module up to the space station as well as the Express Logistics Carrier No. 4 and the Robonaut," says Steve Payne, NASA test director. "We expect a lot of interest in this one and we expect a very good turnout for launch." "So far, it has been a remarkable flow for Discovery. She's been an incredible vehicle and she caps a long and distinguished career with this particular flight. She's always amazed us with everything that she can do. We expect this flight should be no different, and we're looking forward to launch on Wednesday afternoon," said Payne. "It's an 11-day mission with one day contingency and two weather contingency days, should we need them as well. Our end-of-mission is currently planned for 9:59 a.m. Eastern on Sunday, November 14." Engineers have successfully repaired and retested new quick-disconnect fittings in the shuttle Discovery's right-side orbital maneuvering system rocket pod, clearing the way for the start of the ship's countdown Sunday and launch Wednesday on a two-spacewalk mission to deliver critical supplies, equipment and a final U.S. module to the International Space Station. 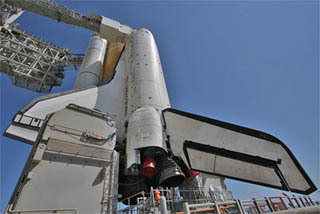 All systems are now "go" for beginning space shuttle Discovery's final launch countdown. Pressurization of the vehicle was completed earlier today, clearing the way for the clocks to start ticking at 2 p.m. EDT. "Work is currently on schedule as we prepare Discovery for launch on Wednesday afternoon. We completed early this morning our flight pressurization of our on-orbit control system tanks and main propulsion system tanks, and all went well. That is behind us now," says Steve Payne, NASA test director. Besides the helium leak that required so much time to resolve, ultimately delaying Discovery's launch by two days, the shuttle team also had a more minor nitrogen leak to track down. Payne said it was found and fixed this morning. "We've resolved our remaining issues with our nitrogen quick-disconnect poppet valve. It turns out it was a ground support equipment valve upstream that was providing too much pressure and not allowing the poppet to close. We isolated that with another valve upstream of that and were able to close the poppet and the leak is now behind us."